"Touch me I'm Sick" b/w "Sweet Young Thing", 1988 Sub Pop Records USA. Condition is ex-/ex-, Clear sleeve is clean with light aging, grape-y PURPLE Vinyl is clean with the usual staining from the legendary Accursed Clear Sleeve. Will be shipped to you in a white sleeve along with original plastic but was stored in the plastic at one time long enough to make its mark. One of just a handful of custom colors pressed 30 years back in 1988. 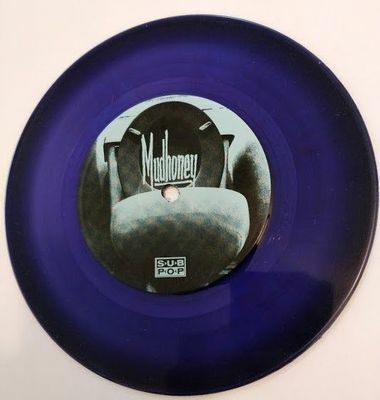 Pictured with a first-press brown version to show this 7" is indeed a super-limited color version and not just a purplish-brown first press. Shipping is $4.00 in The USA, $13.00 International First Class mail to Canada, and $16.00 International First Class Mail for the rest of the world.